Current news, up to 1 year old, is available from the News Page and archived News from the previous 2 years are included on this page. Membership of the Ulster Grand Prix Supporters Club is now due. Just a few weeks after another record-breaking year at the MCE Ulster Grand Prix, organisers have announced that Bike Week 2018 will take place between 5th – 11th August. Practice sessions for the MCE UGP will take place on Wednesday 8th August and the morning of Thursday 9th August, followed by racing that afternoon and on the main race day, Saturday 11th August. The 2018 dates are subject to formal agreement by the Motor Cycle Union of Ireland (UC) which will be confirmed at their upcoming inter centre conference. Clerk of the Course, Noel Johnston, has also confirmed that there are some changes on the way for 2018. When the roads close, records are broken. Legends are born. Have you got your tickets for the 2017 MCE Ulster Grand Prix? Congratulations to all of the prizewinners, who will be contacted individually. Thank you to all who supported the Annual Ballot. The Ballot is a very important source of revenue for the club and without your support we would be unable to honour our financial input to the Ulster Grand Prix. Don't forget to call at our stand. You can save on postage by joining or renewing your membership at the show and collect your membership pack on the day. 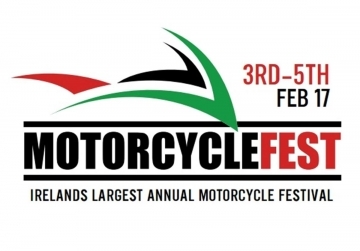 The 2017 N.I Motorcycle Festival will include all the top motorcycle manufacturers and dealers who will be exhibiting their latest range of road bikes, quads and motocrossers. The motocross village will be back again with all the latest motocross bikes plus motocross gear and off road motorcycle clubs with all the information on how to get involved. On Saturday 4th and Sunday 5th, World Superbike legend and "King of the Jungle" CARL FOGARTY will make a special guest appearance. A four-time WSBK Champion, Carl is renowned for his pure road racing exploits at the North West 200, Isle of Man TT and Ulster Grand Prix and a must not miss at this year's festival. Outside activities will include Supermoto Racing, Drifting and Stunt Shows from THE PURPLE HELMETS that will wow the crowds with full on displays and demonstrations. The MCE Insurance Ulster Grand Prix will host Northern Ireland’s only launch of road racing star Ian Hutchinson’s autobiography on Saturday 3rd December at the new Charles Hurst BMW Motorrad Showroom on the Boucher Road in Belfast. The record-breaking Yorkshire-man who is the reigning MCE Ulster Grand Prix Man of the Meeting and one of the sport’s biggest stars will be at the event to meet and greet fans and sign copies of his acclaimed new book. Hutchy will participate in a live Q&A followed by book signings at 10.30am and again at 1.00pm. 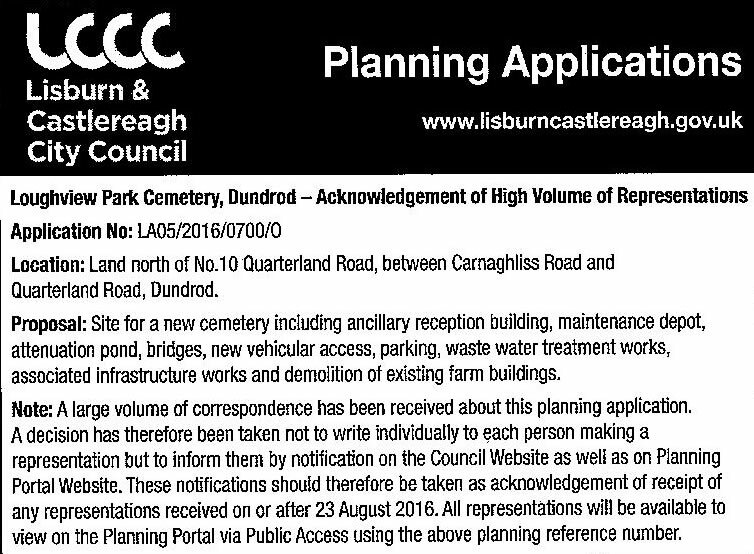 Many of you will be aware that over 3,600 letters of objection to the proposed planning application for a cemetery adjacent to Ireland's Corner, have been received by Lisburn and Castlereagh City Council, Planning Department. The Council recently placed this advertisement in the Belfast Telegraph. Sam Glass Trophy Presentation 2016. 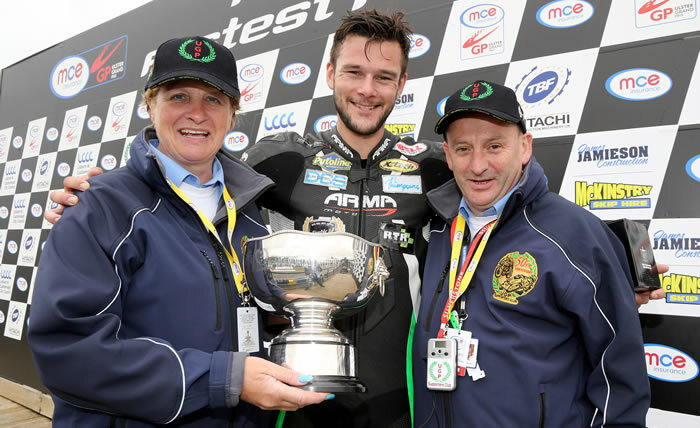 Daniel Hegarty was awarded the Sam Glass Trophy after becoming the highest placed newcomer in the Superbike Race at the 2016 Ulster Grand Prix. The presentation this year was made by Secretary, Gail Baillie and Treasurer, Paul McGovern. 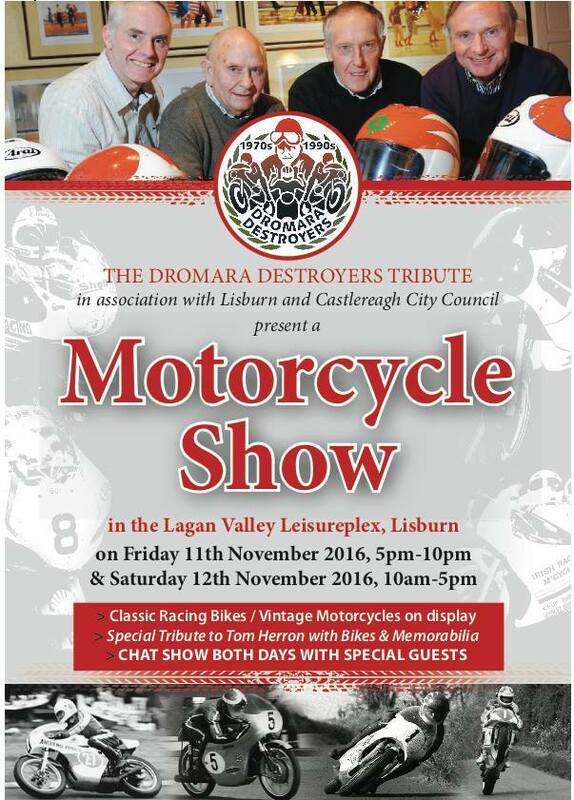 Don't forget to call with us on the Ulster Grand Prix Supporters Club Stand for a chat. Desmond Jardin was recently awarded the British Empire Medal. Former UGPSC Secretary and Founder Member, Desmond Jardin, was recently awarded the British Empire Medal. 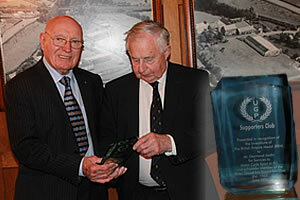 To commemorate the award, UGPSC President, Bertie Bradford recently presented him with a momento on behalf of the club. Fresh from a spectacular week of racing at the 2016 event, the Dundrod & District Motorcycle Club has announced that Bike Week at the 2017 MCE Insurance Ulster Grand Prix will take place from the 7th - 12th August. The key dates are practice sessions on Wednesday 9th August, the Dundrod 150 national races on Thursday 0th August and the main event, the MCE Ulster Grand Prix on Saturday 12th August. 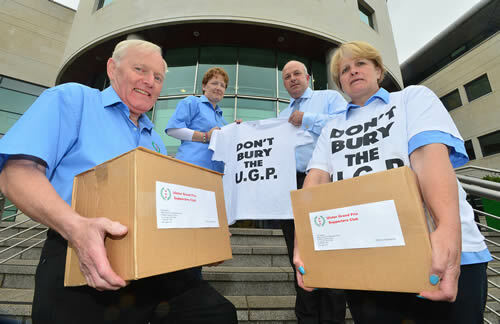 The Ulster Grand Prix Supporters Club has met Lisburn & Castlereagh City Council to hand over more than 3,000 objection letters to plans for a 96-acre cemetery on the Ulster Grand Prix circuit. These will be added to the letters of objection already received by the council’s planning department, making it close to 3,500 objections within just a few weeks of the initial submission of the planning application. The Ulster Grand Prix Supporters Club and promoters of the Ulster Grand Prix, the Dundrod & District Motorcycle Club, are united with a majority of local residents in their opposition to the planned cemetery site on Quarterland Road, Dundrod, for which the only access would be via the world famous motorcycle racing circuit. Des Stewart, Chairman of the Ulster Grand Prix Supporters Club said: “With a hugely successful 2016 UGP just behind us, we are heartened that race fans far and wide feel strongly enough about the impact these plans could have on this international event to submit a letter of objection to Lisburn & Castlereagh City Council. “During the Ulster Grand Prix the public roads are closed for three days, including the Quarterland Road, which is the only access point into the planned cemetery,” added Mr Stewart. “It is customary in this country for burials to happen within three or four days of a death, and for daily access to be afforded to those who wish to visit graves. We just do not see how we could run this event in harmony with the daily business of a cemetery of this size and scale. “I would like to reiterate that we feel that the applicant’s suggestion that they would close the cemetery on the days of racing is unpractical and unsustainable. 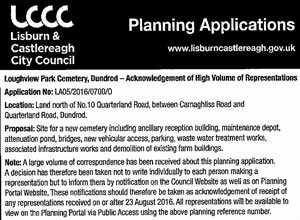 “Furthermore, I believe that planning has been granted for a cemetery and crematorium outside Moira with potential for expansion, also in the L&C area which is more centrally located and served by an excellent road network. When this comes to fruition any argument about the need for a cemetery in Dundrod would be entirely negated,” he said. Alderman James Tinsley, Lisburn & Castlereagh City Council added: “Dundrod sits within my constituency, I have listened to the concerns of many local residents and am in agreement that this plan is not viable. “Setting aside the potential negative impact this proposed cemetery might have on the Ulster Grand Prix, it is very difficult to see how this plan is viable from an infrastructure perspective. “The country roads around Dundrod would not easily cope with the much higher volume of traffic a cemetery of this size would bring, and we must also consider the already elevated accident rate and the area’s propensity for inclement weather which forces the roads to close several times a year,” he added. The Dundrod & District Motorcycle Club and the Ulster Grand Prix Supporters Club invite local residents and the wider racing community to write to the council voicing their objections. The address is: Local Area Planning Office, Lisburn & Castlereagh City Council, Island Civic Centre The Island, Lisburn, BT27 4RL. Quote planning reference LA05/2016/0700/O. 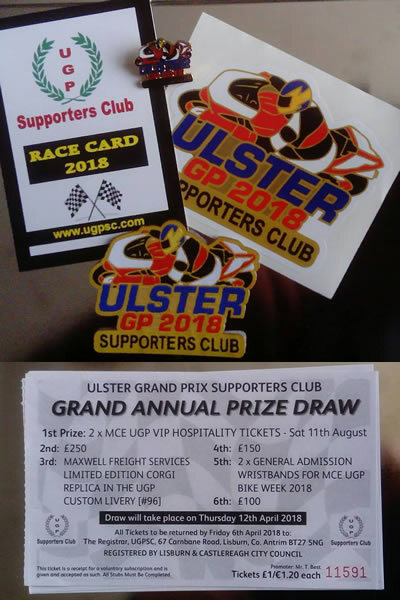 Promoters of the Ulster Grand Prix, the Dundrod and District Motorcycle Club (DDMC) and the Ulster Grand Prix Supporters Club (UGPSC) are together urging race fans and Dundrod residents to oppose plans for a 96 acre cemetery on the race circuit. The two organisations say they are united with a majority of local residents in their opposition to the planned site on Quarterland Road, which have been submitted to Lisburn & Castlereagh City Council. A number of local politicians including Alderman James Tinsley have met with DDMC, UGPSC and the residents on several occasions and are fully supportive of the opposition. The only access to the cemetery would be via the Ulster Grand Prix circuit. "This proposal is fundamentally incompatible with the long established Ulster Grand Prix circuit," said Robert Graham, Chairman of the Dundrod & District Motorcycle Club. "This event is one of the biggest annual events in the road racing calendar, attracting tens of thousands of visitors from across the world. The economic impact is significant; spectator spend alone generates an estimated £2.5 million every year, and there are more than 10,000 commercial bed nights. "In social and cultural terms, the Ulster Grand Prix is part of the established fabric of the area and all steps must be taken to protect this important local event. "The applicant has suggested the concept of closing the cemetery on the days of racing, which is simply not practical. In planning terms, such a condition would be viewed as unreasonable and we believe this suggestion to be meaningless because it is clearly unsustainable. "There's also the flexible road closing order 'Road Races (Northern Ireland) Order 1986 Amendment Act (Northern Ireland) 2014' to consider, whereby we can swap the day the roads close with 24 hours notice to avoid cancellation of the race altogether due to inclement conditions. "What would we then do if we changed racing from a Thursday to a Friday only to discover that numerous burials had been planned for that day? It would create utter chaos and an impossible situation," he added. Des Stewart, Chairman of the Ulster Grand Prix Supporters Club said: "The cemetery proposal will serve the Greater Belfast area and with such a large population base, it is likely that there would be frequent funerals and visitors to graves on a daily basis, just like at Roselawn. "It is customary in Northern Ireland for funerals to be held within three or four days of a death, and for daily access to be afforded to those wishing to visit graves. "The ambience of a cemetery of this magnitude is irreconcilable with the nature of a high adrenaline sport such as motorcycle road racing, during which the public access roads to the cemetery would be closed, and I just do not see how the two can co-exist in harmony. "We believe that if it were to go ahead, it could seriously hinder our ability to continue to run one of Northern Ireland's longest running and largest outdoor events, and one which has a massive economic impact," stated Mr Stewart. Robert Graham added: "Quite apart from economic implications of disruption to such a large scale event, we believe that the infrastructure in the area would be unable to cope with the sheer volume of traffic that a cemetery of this size would bring. "The accident rate in that area is already high and given the mountainous terrain, roads are regularly affected by and forced to close due to climatic conditions such as snow. "There are no streetlights, no footpath, no public transport links and the fields are often waterlogged. We cannot fathom how this site has been chosen as an appropriate location for a business of this nature. It is simply not suitable." The Dundrod & District Motorcycle Club and the Ulster Grand Prix Supporters Club invite local residents and the wider racing community to write to the council voicing their objections. The address is: Local Area Planning Office, Lisburn & Castlereagh City Council, Island Civic Centre, The Island, Lisburn, BT27 4RL. Quote planning reference LA05/2016/0700/O. 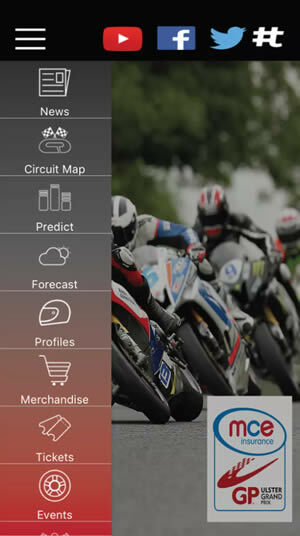 Promoters of the MCE Ulster Grand Prix have announced the release of a new fan app, designed by Sportego. The app, which is free to download to Android and iOS devices, provides fans with the latest news, rider statistics, circuit information and details on ticket purchase and more. The app has been purposefully designed to combine informational and interactive features, allowing fans to easily access the MCE Ulster Grand Prix website, YouTube and the MCE UGP Facebook and Twitter accounts. There is also an interactive “Tagboard” which is streamed to the app, and allows fans to share their thoughts and photos, all at the click of a button. Clerk of the Course at MCE Ulster Grand Prix, Noel Johnson said: “This app is a fantastic means of encouraging people to engage with Bike Week. It will allow users to learn more about their favourite competitors, the circuit set-up and even gives up to date weather information to ensure that fans can be where they want to be, when they want to be, and can be dressed appropriately for the weather too! 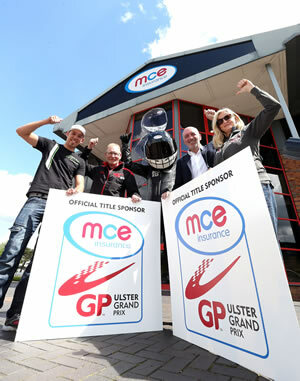 The Ulster Grand Prix is proud to announce that its new title sponsor is the UK and Ireland's number one bike insurer, MCE Insurance. The high profile, independently owned motorcycle insurance company, who also headlines the British Superbike Championship, has agreed a significant three-year deal to sponsor the world's fastest road race, which will now be known as the MCE Insurance Ulster Grand Prix. Commenting on the deal, MCE's CEO Julian Edwards said: "We are incredibly proud to finally release the news that we will be the title sponsor for the MCE Insurance Ulster Grand Prix. "We have been interested in sponsoring a road racing event over in Ireland ever since we began offering insurance for Irish bikers back in 2014, when the opportunity at the Ulster came up it was one we just couldn't refuse! With such an incredible history, the event truly is a jewel in the road racing calendar! team. Racing is in our blood here at MCE and this is a very exciting new chapter for us." "We are truly delighted to make this major announcement, which marks the beginning of an exciting new chapter for the Ulster Grand Prix," said Noel Johnston, Clerk of the Course at the Ulster Grand Prix. 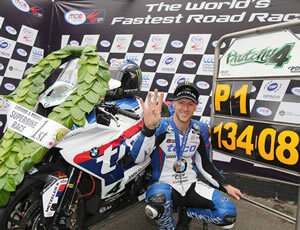 "We've seen and been impressed by the support MCE Insurance has offered the BSB in the past eight years. This a company that understands bikes and the mentality of both bikers and bike fans, making it a fantastic fit for us and one which we believe will allow us to really build our profile as the world's fastest road race across the UK, Ireland and beyond. "For us, MCE's decision to commit to a three year deal is a clear demonstration of confidence in the strength of our event, which undoubtedly offers some of the most thrilling racing seen anywhere on the roads, and its ability to offer significant exposure and value to its partners. "It goes without saying that there would be no event without the support of our stakeholders, and this is an opportunity for us to thank MCE for getting involved, as well as organisations such as Lisburn & Castlereagh City Council, Tourism NI and the Ulster Grand Prix Supporters Club, plus a wide range of private sector sponsors for their ongoing support. We will have more news on this front in the coming weeks. "As our recent decision to introduce a superpole qualifier for the superbike class for the first time in road racing shows, we are working hard behind the scenes to deliver another spectacular week of racing this August, and I don't think the fans will be disappointed," added Noel Johnston. The MCE Insurance Ulster Grand Prix will take place between 8th - 13th August at Dundrod, Co. Antrim. Key events are the Dundrod 150 on Thursday 11th August and the Ulster Grand Prix on Saturday 13th August. There will be practice sessions on Wednesday 10th and Thursday 11th August and a full programme of entertainment each night in the hospitality marquee. General admission wristbands and tickets for the Joey Dunlop Grandstand are now on sale with Ticketmaster. Twitter @UlsterGrandPrix and find us on Facebook. The draw for the 2016 Ballot took place at the recent Annual General Meeting. All prizewinners have been notified. After many years as hard working club President, Andy Pinkerton has decided that it is time to hand over the reins. Andy’s successor was elected at the recent Annual General Meeting and is long serving committee member, Bertie Bradford.